6-Keto Prostaglandin F1α (6-k-PGF1α) is a stable hydrolyzed product of unstable Prostacyclin (PGI2) which is derived from Prostaglandin H2 (PGH2), which in turn is synthesized from the arachidonic pathway. Through the arachidonic pathway, it is the major product produced by the endothelial cells, although it is also synthesized in other cell types such as macrophages. PGI2 inhibits platelet aggregation and induces vasodilation. Quantitation of PGI2 production can be made by determining the level of 6-k-PGF1α. Urine and tissue culture supernatants can usually be assayed directly by diluting them with the EIA buffer provided. 6-k-PGF1α can be extracted from plasma using Sep-Pak columns according to a protocol provided with the kit. 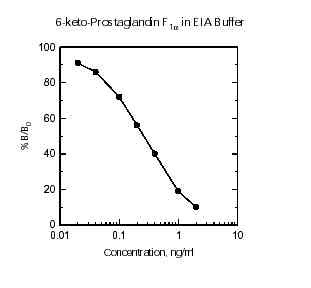 This is an ELISA for the quantitative analysis of 6-k-PGF1a levels in biological fluid. This test kit operates on the basis of competition between the enzyme conjugate and the 6-k-PGF1a in the sample for a limited number of binding sites on the antibody coated plate. The sample or standard solution is first added to the microplate. Next, the diluted enzyme conjugate is added and the mixture is shaken and incubated at room temperature for one hour. During the incubation, competition for binding sites is taking place. The plate is then washed removing all the unbound material. The bound enzyme conjugate is detected by the addition of substrate which generates an optimal color after 30 minutes. Quantitative test results may be obtained by measuring and comparing the absorbance reading of the wells of the samples against the standards with a microplate reader at 450nm or 650nm. The extent of color development is inversely proportional to the amount of 6-k-PGF1α in the sample or standard. For example, the absence of 6-k-PGF1α in the sample will result in a bright blue color, whereas the presence of 6-k-PGF1α will result in decreased or no color development.